Add some charm to your household plants with this simple yet striking pattern. 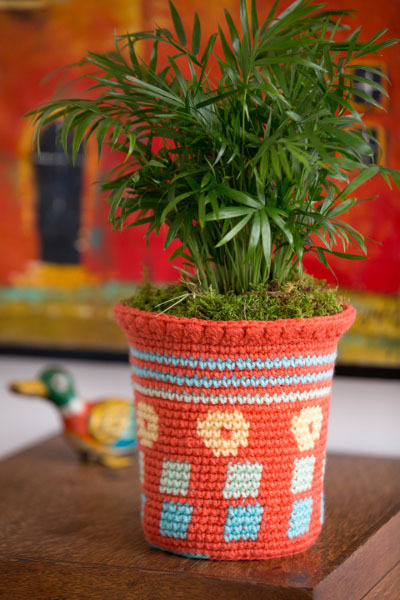 Just place this crocheted cozy over a container and instantly add a splash of color to your surroundings. Designed by Nirmal Kaur Khalsa. 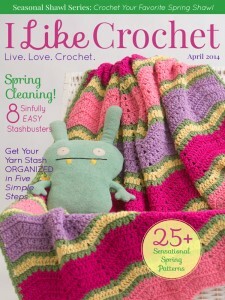 Beginning at bottom, with A, ch 3; join with slip st in first ch to form a ring. Rnd 9: With A, carrying B on wrong side, and working in back loops only, ch 1, sc in each st around; join with slip st in first sc. Rnd 10: Ch 1, sc in each st around; join with slip st in first sc. Rnds 11-14: With A, ch 1, sc in next 2 sts; change to B, [sc in next 4 sts; change to A, sc in next 4 sts; change to B] 7 times, sc in next 4 sts; change to A, sc in last 2 sts; join with slip st in first sc. Rnd 15: Repeat Round 10. Rnds 16-19: With A, ch 1, sc in next 3 sts; change to C, [sc in next 4 sts; change to A, sc in next 4 sts; change to C] 7 times, sc in next 4 sts; change to A, sc in last st; join with slip st in first sc. Rnd 20: With A, repeat Round 10. Rnd 22: With A, ch 1, sc in next 3 sts; change to D, [sc in next 5 sts; change to A, sc in next 6 sts; change to D] 5 times, sc in next 5 sts; change to A, sc in last 3 sts; join with slip st in first st.
Rnd 23: With A, ch 1, sc in next 3 sts; change to D, [sc in next 2 sts; change to A, sc in next st; change to D, sc in next 3 sts; change to A, sc in next 5 sts; change to D] 5 times, sc in next 2 sts; change to A, sc in next st; change to D, sc in next 3 sts; change to A, sc in last 2 sts; join with slip st in first st.
Rnd 24: With A, ch 1, sc in next 3 sts; change to D, [sc in next 6 sts; change to A, sc in next 5 sts; change to D] 5 times, sc in next 6 sts; change to A, sc in last 2 sts; join with slip st in first st.
Rnd 25: With A, ch 1, sc in next 4 sts; change to D, [sc in next 4 sts; change to A, sc in next 7 sts; change to D] 5 times, sc in next 4 sts; change to A, sc in last 3 sts; join with slip st in first st.
Rnd 26: With A, repeat Round 10. Rnd 27: With C, repeat Round 10. Rnd 28: With A, repeat Round 10. Rnd 29: With B, repeat Round 10. Rnds 30-31: Repeat Rounds 28 and 29. Rnd 32: With A, repeat Round 10. Rnd 35: With A, ch 3, bobble over first 2 sts, *bobble over next 2 sts; repeat from * around; join with slip st in top of beginning ch-3. Fasten off. Continue working same as Rounds 10-35. Weave in beginning tail to join lower edge of Round 1. Weave in ends. Insert container.